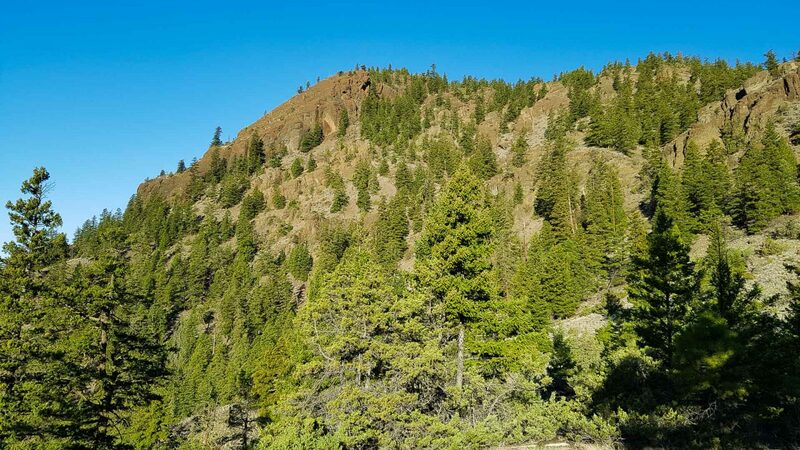 Rousseau Hill is a prominent point on the north side of Kamloops Lake, and has been a popular hike for many years for those hiking the Dewdrop area west of Kamloops. 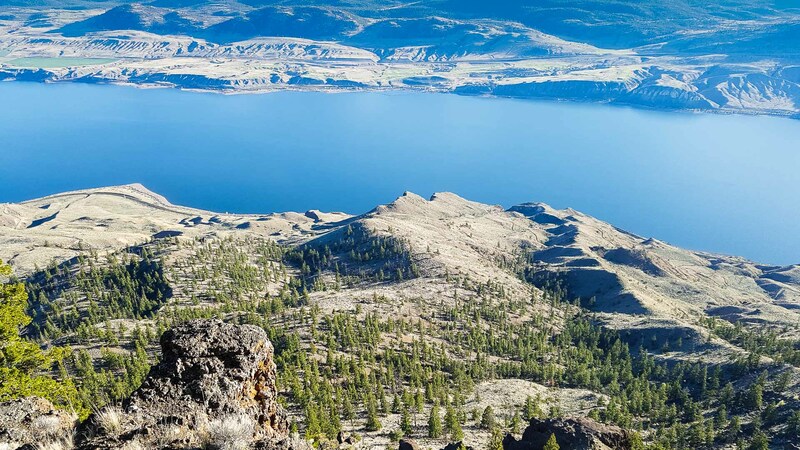 Due to its relatively low elevation, it can be reached throughout most, if not all, of the year, depending on the snow pack and driving conditions in the area, which can get very muddy. 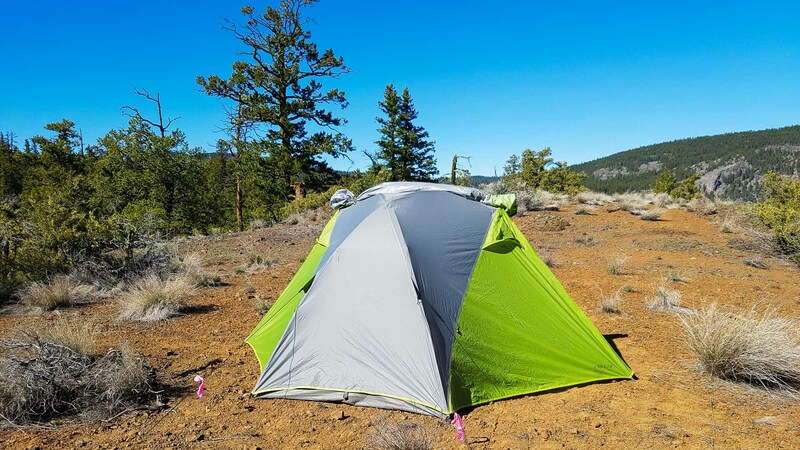 This year we have both hiked and backpacked for a single overnight on Rousseau Hill. Our first trip up was a bit long as we parked a long ways from the hill and had a long walk just to get there and back. On our second trip up, we were able to follow an old road to within a couple of kilometers of the top. It should be noted, though, that the road does require a high clearance or four wheel drive vehicle as it is very rough and washed out in places. While it was a longer walk from our chosen parking location on our first hike up, it is not very difficult being that it is largely on wide, double track roads. And we did get the opportunity to see other things, like some of the canyons, that would be missed by driving to the trailhead. Of course, there was more elevation gain since the drive reduces that quite a bit. For those are able to drive up to the trailhead, there is a trail to be found that heads up to the top for a bit. We found that the trail seemed to come and go but it was still relatively easy to find a route up. 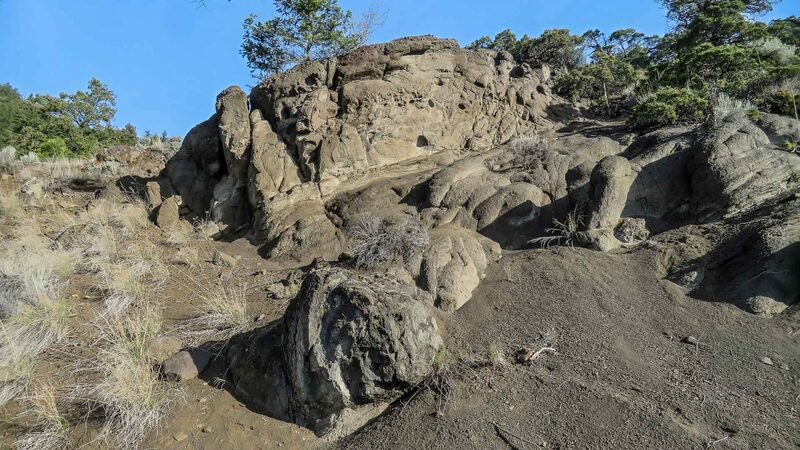 We would recommend sticking more to the northern side of the hill as there are a lot more rock formations on the south side that would need to be circumvented. And it’s not good climbing rock, being that it’s just largely compressed sand and readily crumbles. 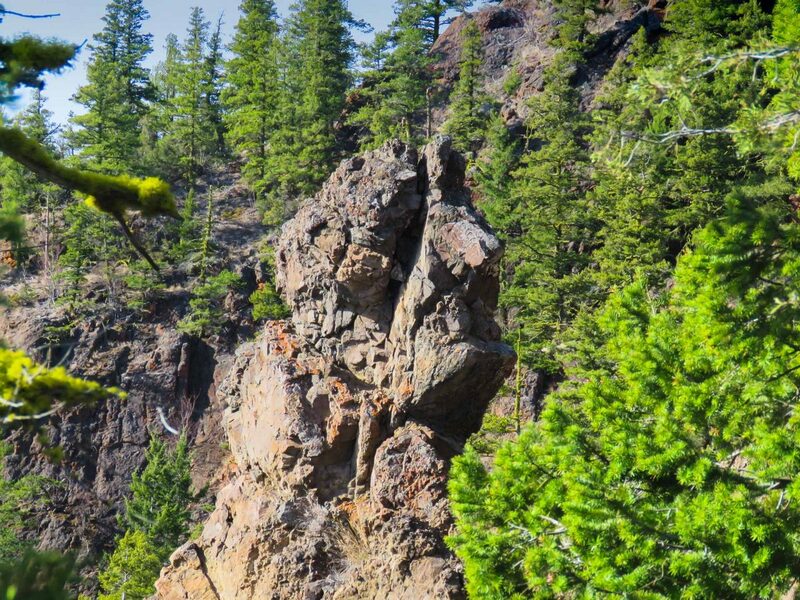 Most of the trail is in the trees and on a warm day, they provide a welcome relief on what is quite a steep route up. There were not a lot in the way of views for much of the trip up but there were still plenty of neat rock formations to see along the way. It doesn’t take very long to get to the top, even with an overnight pack on, and once past a couple of steep pitches, it’s a fairly easy walk through the forest with very little in the way of undergrowth. 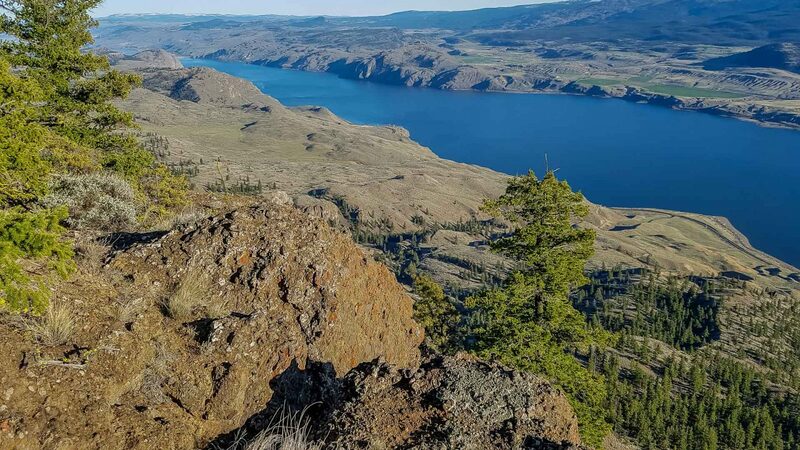 The actual top of Rousseau Hill lies a bit to the west of where we came up so we made our way over until we reached the cliffs and were able to enjoy the views of the western part of Kamloops Lake. On our first hike up, we just walked around a bit, had some lunch, and made our way down since we had a long walk back to the truck. Unfortunately, on that first trip, we ran into a crowd of people on quads drinking beer. Sadly, they left behind a bunch of empty cans, which we picked up on our next trip in. As we were camping on the hill for the second trip, we walked around until we settled on a nice location to pitch a tent. Due to the heavy wind that was blowing that day, we elected for a sheltered spot more to the south of the top. 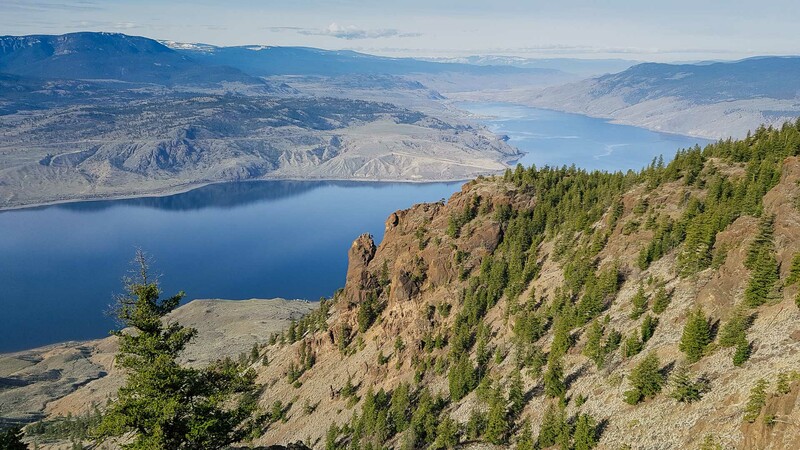 Nearby, we found a great location to set up our chairs on a small point that faced eastward towards Kamloops. The contrast of the green of the trees, the blue lake, and the stark browns of the grasslands and rocks really stood out. After setting up our camp, we spent the afternoon checking out the rock formations and grabbing a couple of geocaches that are in the area. There are many vantage points that display the rugged beauty of the area and on clear days like we had, we could see way far off to the distant horizons. After a somewhat chilly and windy but clear night, we awoke to a cool morning with the rising of the sun. Within a short time, we had eaten, packed up, and started on our way back down. Needless to say, it is an easy descent, and it didn’t take us long to get back to our vehicle for the drive home. 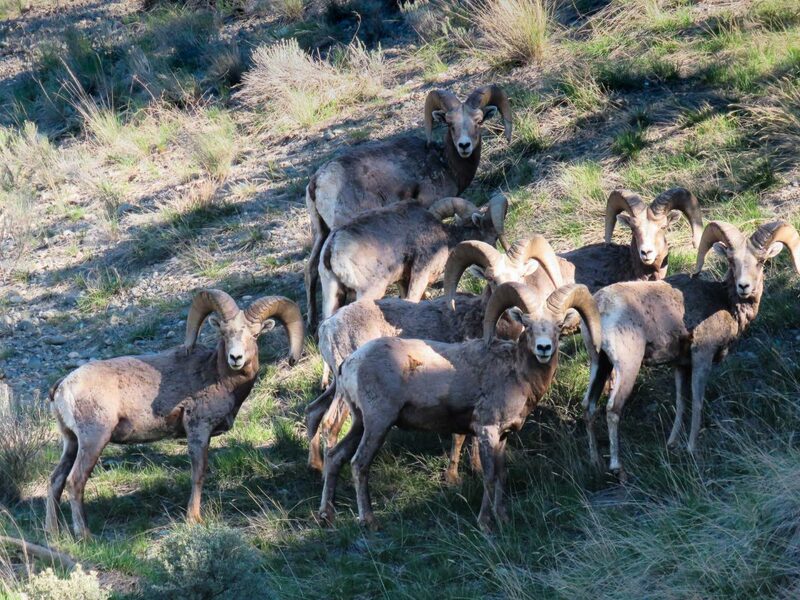 We did get a bit of a surprise when we encountered some people coming to count sheep on the drive down, but fortunately, we met them in one of the few places where we could back up to let them around us. Up to this point, we had only seen lots of deer along the way but we luckily came across a herd of sheep along the road. 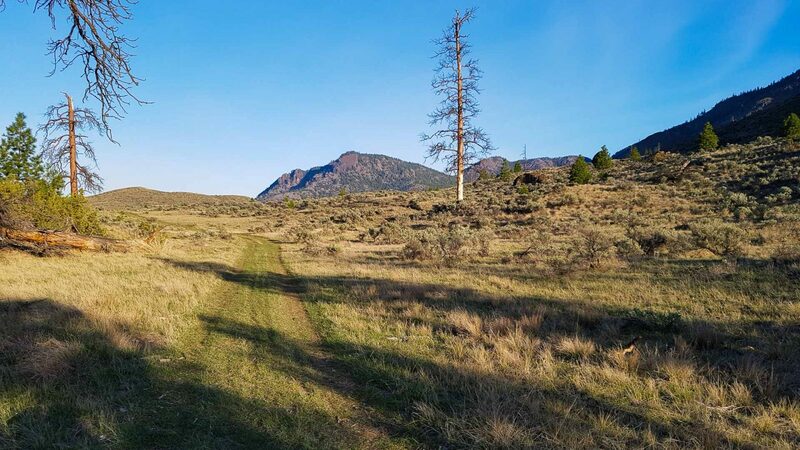 Rousseau Hill is a great location for anyone looking for a bit of on and off trail hiking in the Kamloops area. While there wasn’t much in the way of trails to get to the top, it’s pretty easy to find a way up, and be able to experience some of the best views to be had in the area. Due to a lot of exposure to the sun, we would suggest this as an early or late season trip, as mid-summer gets plenty hot and there is no water to be found. You will need to bring plenty of water along. And also as a caution, in the spring, there were loads of ticks and we were constantly pulling them off of our clothing and bodies. We certainly do recommend hiking Rousseau Hill for another out for a day of hiking, or a quick overnight backpack, in some rugged and beautiful terrain.